Sally Mann has always remained close to her roots. She has photographed in the American South since the 1970s, producing series on portraiture, architecture, landscape and still life. She is perhaps best known for her evocative and resonant landscape work in the American South and for her intimate portraits of her young children and her husband. Her work has attracted controversy at times, but it has always been influential, and since the time of her first solo exhibition, at the Corcoran Gallery of Art, Washington D.C., in 1977, she has attracted a wide audience. Sally Mann explored various genres as she was maturing in the 1970s, but she truly found her metier with her second publication, a study of girlhood entitled At Twelve: Portraits of Young Women (Aperture, 1988). Between 1984 and 1994, she worked on the series, Immediate Family (Aperture, 1992), which focuses on her three children, who were then all aged under twelve. While the series touches on ordinary moments in their daily lives – playing, sleeping, and eating – it also speaks to larger themes such as death and cultural perceptions of sexuality. Mann has produced two major series of landscapes: Deep South (Bullfinch Press, 2005) and Mother Land. Mann has remained most interested in black and white, especially photography’s antique technology. She has long used an 8x10 bellows camera, and has explored platinum and bromoil printing processes. In the mid 1990s she began using the wet plate collodion process to produce pictures that almost seem like hybrids of photography, painting, and sculpture. Sally Mann lives and works in Lexington, Virginia. A Guggenheim fellow, and a three- times recipient of the National Endowment for the Arts fellowship, Mann was named “America’s Best Photographer” by Time magazine in 2001. In May 2011, she served as prestigious speaker at Harvard University for the William E. Massey, Sr. Lecture in the History of American Civilization with a series entitled, “If Memory Serves.” She has been the subject of two documentaries: Blood Ties (1994), which was nominated for an Academy Award, and What Remains (2007) which premiered at Sundance and was nominated for an Emmy for Best Documentary in 2008. She has been the subject of major exhibitions at the Institute of Contemporary Art, Philadelphia, and the Corcoran Gallery of Art, Washington, D.C and the Virginia Museum of Art, Richmond, VA. Her photographs can be found in many public and private collections, including the Metropolitan Museum of Art; the Museum of Modern Art, and the Whitney Museum of American Art. 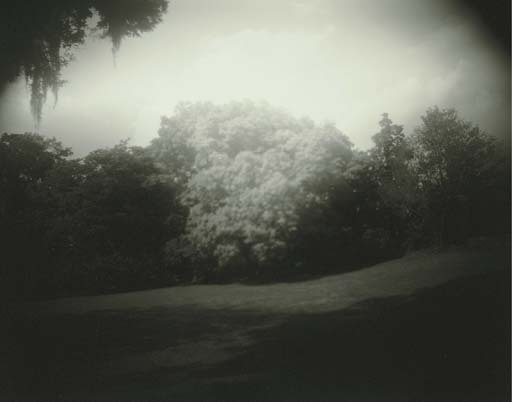 This photograph is in the original exhibition frame designed by Sally Mann.